Hi, quick question, is this module compatible with Magento 1.7.0.2? Best Regards, Luca. Hello It's specified in details section that this theme supports RTL but I couldn't find out how it is possible to enable RTL through its configurations. Would you help please? Hello,Can you check my ticket to some problems I have whit the theme (Created: 06/27/2018 9:53AM)? Hello, We're interested in purchasing this template but I do have two questions for you:1. Is this template compatible with Magento version 1.9.3.0? 2. We want this template to be shown only when on a mobile device / tablet to make use of the responsiveness, but on desktop we would still like to use the standard look of magento. Is this possible?Thank you! Can you please check support ticket ID: #5a27e27e85e99de379a47b8d ?We need your help to solve this https://www.screencast.com/t/zybwvnW9SpVZ issue.Thanks! Hi,We are interested in buying this theme.We have a question though.When viewing the theme for Magento 1 on a mobile device (any smartphone we tested), we noticed there is a blank space to the right of the screen. You can in fact see the horizontal scrollbar at the bottom of the screen. I could provide screenshots but there's no option here.Magento 2 theme on mobile device doesn't have this blank space.Could this be avoided?Thanks,Elisabeth. Hi,We are very interested in getting this magento admin themehttps://cmsmart.net/magento-themes/magento-responsive-admin-templateJust wanted to check with you guys first whether this supports magento 1.9.3.6 version? When I try to log into the Magento 2 demo, I get the following message:You did not sign in correctly or your account is temporarily disabled. 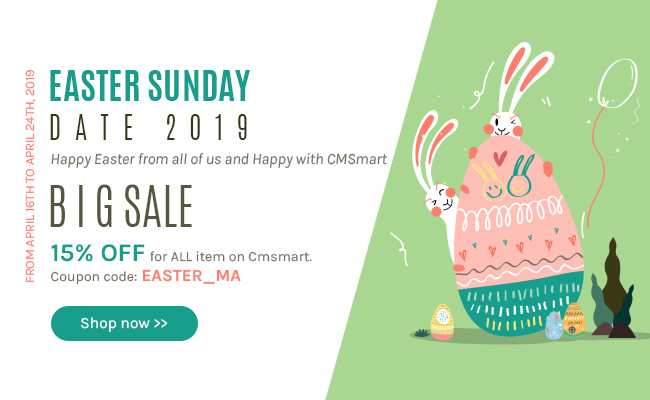 When I look into the demo for Magento1 there is a possibility to change the configuration of the Cmsmart AdminTheme (system -> configuration -> Cmsmart extension).I can't find that option in the Magento2 demo. Can you tell me where I can find it?